The Holy T Art Fair is a new event featuring artists from the Newcastle Hub of Network Artists North East. It will be a great opportunity for you to meet and talk to 25 different artists – and maybe purchase something as a treat for you or your loved ones! The Holy Trinity Church is easy to find as it’s just at the end of Armstrong Bridge in Jesmond. And if you do have to travel to get there…there’s a cafe! 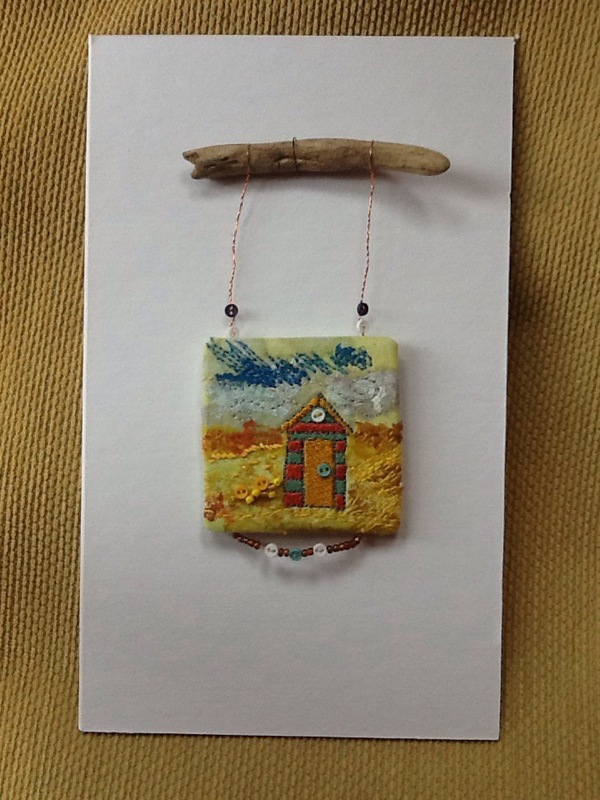 In the meantime, here’s one of my mini beach huts – very popular at Carlisle! This entry was posted in Uncategorized on August 31, 2015 by donnacheshiretextiles. Last Summer, I visited Kirkudbright in Dumfries & Galloway at the time of the Art Trail. In the museum exhibition of ‘The Glasgow Girls’ I came across a portrait of a child by Joan Eardley. It intrigued me, the collage background, strong colours and the energy contained in it. I returned home determined to investigate further, searched on line and bought a Book. 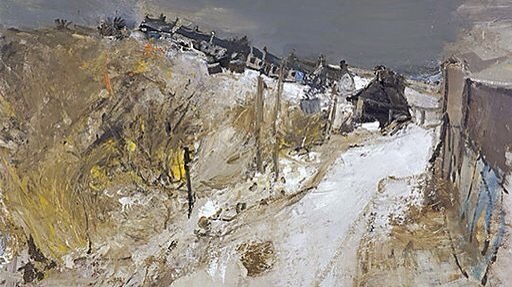 I found out that Eardley painted wonderful expressive landscapes in the mid 20th Century, that she had painted on the Isle of Arran, North East Scotland and Glasgow. The more I discovered, the more I was determined to see some of this work in reality. On Friday, almost a year since I first saw her work, I achieved my ambition. There is a wonderful exhibition at the Clydebank Museum & Art Gallery. The show includes works from across her career including some not seen in public before. I was so thrilled to find four rooms of her work. To see sketches, prints, ink drawings and oil paintings, to be able to look closely at those wonderfully layered and textured surfaces. It was overwhelming. Her work touches me deeply. The energy enclosed within them, the fearless approach to making art. By one seascape the notice stated that she painted outdoors and weighted her easel down with an anchor! Some pencil studies (sketchbook pages?) had hand written notes about colours on them. The summer landscapes include pieces of grass and flower stems encrusted in the thickly applied paint. Glasgow tenement portraits included collages of newspaper and gold in the background. Oil and water based media were mixed and layered to achieve vibrant colour contrasts. As I walked from room to room, my head was buzzing with ideas, the texture, the scale, the intent to capture the ever changing weather, seasons and surface of the sea. Scribbling furiously in my sketchbook I tried to capture the emotions that the work evoked in me, and to memorise as much of the work as I could. I’m trying to find ways to develop these layers of colour and texture using fabric and stitch, manipulating surfaces to capture the energy of the landscape and the effects of the seasons. I want to fill piles of sketch books with samples and colour studies. I want to get out and draw or paint directly in the landscape, to stitch, rip, layer and create. 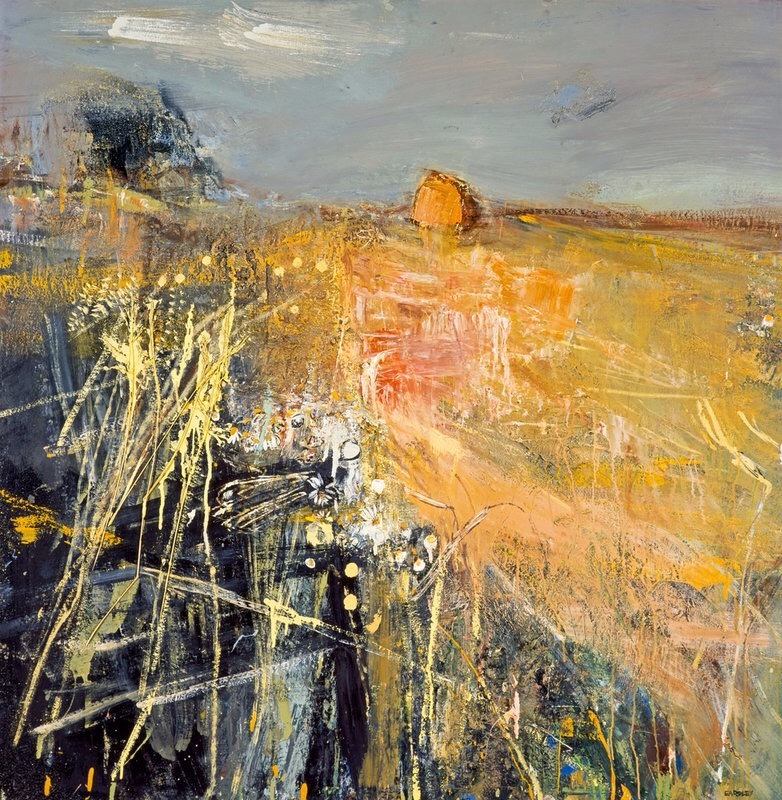 With the hope that my textile works can capture the same energy and fierce joy that I find in the works of Joan Eardley. I hope you’ll find her work as enthralling as I do. This entry was posted in Uncategorized on August 1, 2015 by donnacheshiretextiles.